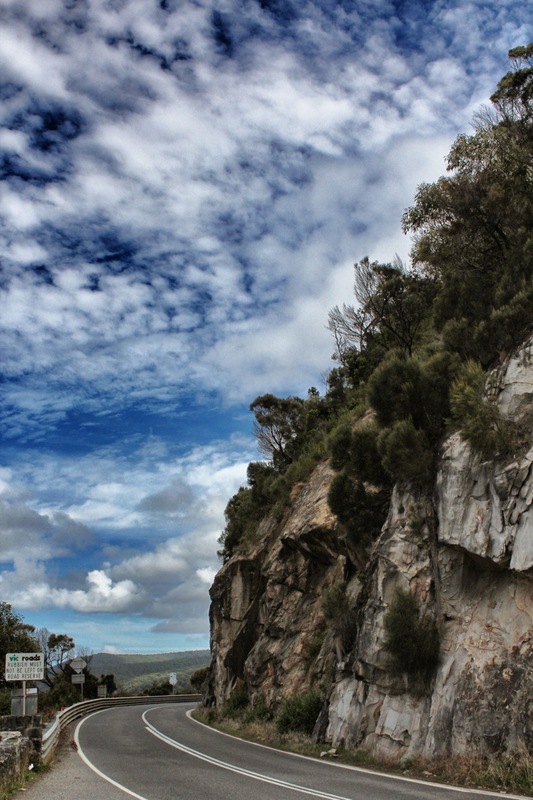 It isn’t a particularly casual drive along the Great Ocean Road, considered one of the great drives of the world. When you’re the driver, the curves and hairpin turns are enough to turn your hair gray and prevent you from gazing at the spectacular scenery offshore. The journey is even more suspenseful when you’re accustomed to driving on the right side of the road, as we Americans are. Victoria’s Great Ocean Road is the equivalent of our Highway 1 in California through Big Sur, though the American drive is half the length. The most popular attraction are the Twelve Apostles, towering sandstone sea stacks toward the western end of the road. Geological peculiarities are normally of great interest to me, but this time my wife and I both decided against seeing these admittedly fascinating rock pillars. The biggest reason, and one which we’ve confronted many times in the kind of traveling we like to do, is that we were stationed for three nights in one place in Torquay at the other (east) end of the Ocean Road. The general estimate for driving to the Apostles is 3 ½ to 4 hours from Torquay, making the round trip an all-day affair with time to do little else. Staying at one place has its limitations. With that decision out of the way, we just went a short way down to Lorne for lunch and made several stops along the way to soak in the views. This coast has some of the world’s best surfing, the most famous spot being Bells Beach, host of the Rip Curl Pro event. Australia is perceived as being an arid land, the Outback an imprecise term for the landscape and sparse population encountered there. The verdant areas are mostly confined to the coastal areas, which is where ninety percent of Australians live. 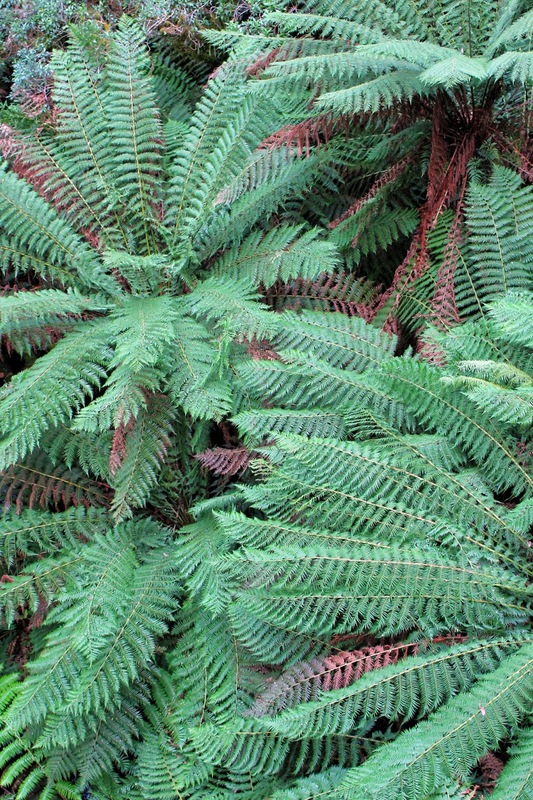 It may come as a surprise that there are rain forests in Australia. 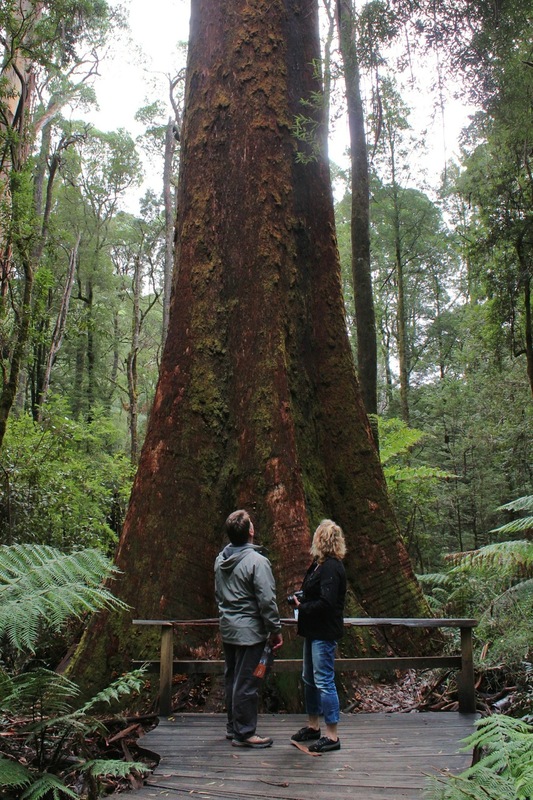 The Otway Ranges are such places, hugging the Great Ocean Road along its eastern edge. One way to get there from Torquay is through Lorne along the Great Ocean Road, but the faster way is inland via the Princes Highway that has some interesting small towns along the way, including Birregurra where we stopped to pick up a sandwich. Almost as soon as we headed south from Colac toward the mountains, the scenery visibly began to change from a flat, almost featureless terrain, to one of rolling hills and pastureland, with great stands of gum trees. It also became increasingly green. When we reached the upper elevations, the sclerophyllic forest became denser, with very big and tall trees and heavy fern understories. 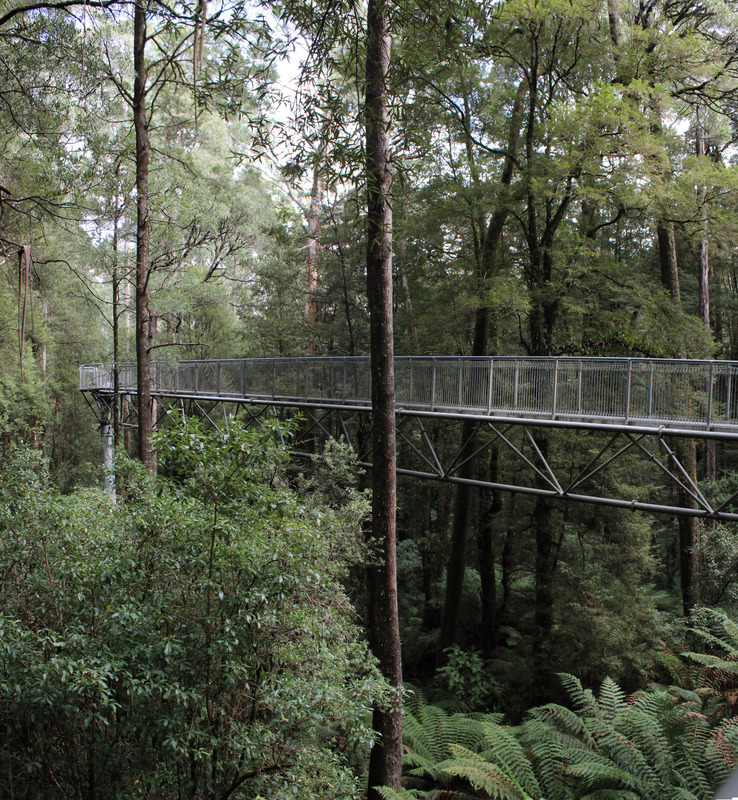 Here, the Otway Fly promised excitement with ziplining and the world’s longest and highest treetop walk. 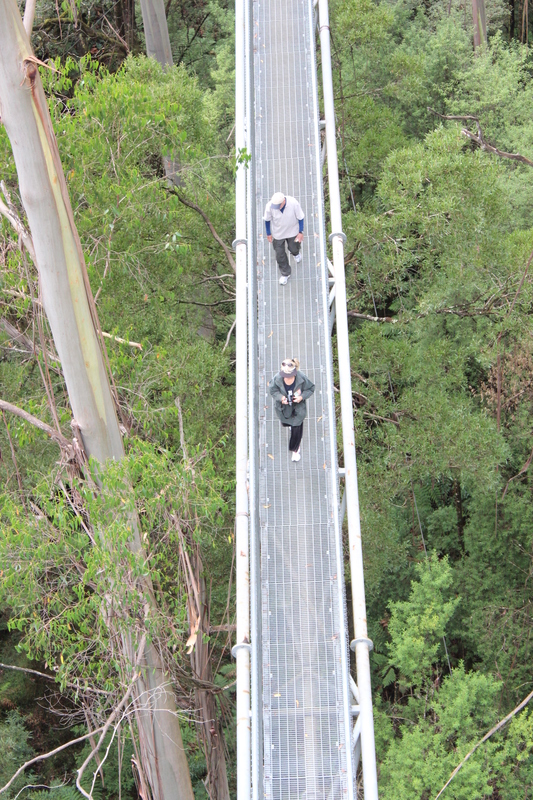 The walk encompasses 600m (1968ft) of steel walkway supported high into the canopies of the tall mountain ash, blackwood and myrtle beech trees, towering above tree ferns. The footpaths are grates that can be psychologically discomfiting when looking straight down, suspended 30m (100ft) above the ground. Higher yet is the Spiral Stair whose top is 45m (148ft). For an eerier experience, we went to the end of one walkway that is cantilevered over the forest floor and thus susceptible to flexion when winds come through the forest. In fact, it was gently yawing as we were standing at its end. 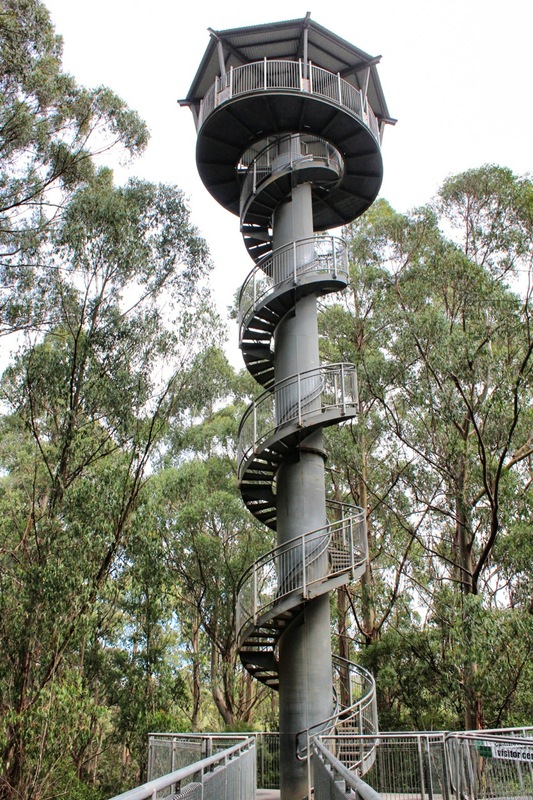 The Spiral Stair is 45m in height. In the opposite direction from Torquay is the Bellarine Peninsula where attractions are historic rather than natural. At the tip is Queenscliff, an old fishing village and home to several Victorian-style hotels. The GPS route, which claimed a faster drive time than taking the B100 and B110, involved so many small sections of less than 10km each that we lost count, interrupted by many multi-lane roundabouts so common in Australia and New Zealand. Queenscliff’s CBD extends no more than three blocks, but there are several historic buildings, including a restored post office and the Victorian Vue Grand Hotel. Tourism hasn’t seemed to affect its quaint, small town atmosphere. Restored interior of the Vue Grand Hotel. Trains only make “heritage” journeys to nearby Drysdale and Lakers Siding. Australian magpies sing their beautiful songs all over Australia. Wrought iron fretwork was frequently used in Queenscliff architecture. Queenscliff also has a ferry terminal. In 40 minutes, a ferry sails to Sorrento, a town of well-heeled residents and with a quaint commercial district. Along the way, bottlenose dolphins swam alongside the boat, both going and returning. The view toward Port Phillip from the walk up the hill along well-kept cottages is quite spectacular. Shops, restaurants and galleries line Ocean Beach Road, the main thoroughfare through Sorrento. There are no finer displays of produce than at Scicluna’s Real Food Merchants. We happened upon impressive driftwood animal sculptures at Happy Days Sorrento (155 Ocean Beach Road), a funky gallery and quirky housewares store. Just Fine Food (23 Ocean Beach Road) serves what many regard as Australia’s finest version of vanilla slice, known in France as mille-feuilles, a custardy dessert sandwiched between two layers of flaky crusts with plum jam and powdered sugar. It is barely sweet, a good thing, but otherwise didn’t appeal to us as much as fans of creamy desserts. Now, that’s a civilized picnic table! The Bellarine Peninsula gets short shrift from tourists who would rather enjoy the splendors of the Great Ocean Road, but it’s a nice alternative to gazing at natural wonders. This entry was posted in Australia, travel and tagged Bellarine Peninsula, Otway Fly, Queenscliff (VIC), Sorrento (VIC). Bookmark the permalink.